Last Saturday, my son and I spent about 5 hours on a beautiful Saturday afternoon watching shows at the Chicago Fringe Festival. It was the last weekend of the Fringe, and it was a lot of fun. It was (I think) my son's first Fringe festival, and I don't think he'd been to 3 shows in one day. Overall, he had a pretty great time! Chicago Fringe Day 1: Just Add Gravity, Underneath the Lintel, Mark Toland Mind reader. 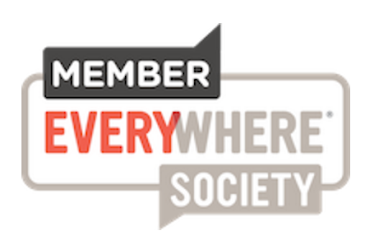 PLEASE NOTE: As with many of the theatre shows I review on this site, I did receive free entry to the shows with the hope that I would write about them. My opinions remain my own, uninfluenced by the price. I take my integrity seriously, and so should you. While the shows are now over, many of these companies are Chicago based and continue to run programs that it is possible to see. I also think it's good to give artists a review of their work. All told I saw 9 shows at the Fringe this year, and had a great time doing it. I hope to go to at least as many shows next year! Here are the reviews of the shows we saw on the last Saturday of the Fringe. 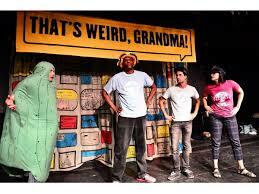 That's Weird Grandma is a show by Chicago group Barrel of Monkeys. They do something smart and pretty interesting. They go into schools and work with kids on storytelling. The kids write the stories, and then the improv troupe acts them out, the best of the stories they collect and put together into their shows, which appear regularly on Chicago stages (after the Fringe festival, they are starting another open-ended run at the NeoFuturarium.) In this way, they are getting paid by the schools to work together to develop material, and at the end, the student writers get to see their work put on by a professional company rather than just sit on a refrigerator somewhere. It's Win, Win, Win! The show was a lot of fun, mostly because the stories all featured amazing kid logic. One of the stories was about a pie that doesn't want to be a cannibal and refuses to eat other pies. Another one featured a kid who wished for wizarding powers and what happened once she got them. A third story was a monologue by the monster that lives under the bed. The stories were all printed in the program, so you could compare the source material with the adaptation. The 55 minute show had 15 stories in it, performed by a cast of 7 or so plus a musician who provided musical sound effects for all the shows. The costumes and props are relatively minimal (although there was a unicorn head that was fantastic as a mask. The acting was fine and entirely servicable, although perhaps a touch too broad all the time. It would have been nice to see on occasion, a lighter touch. Perhaps the best thing that can be said about the acting is that it never makes fun of the subject matter. The actors are there to serve the story, and they do. This was an enjoyable show, and I'd highly recommend seeing a version of it if you get a chance. The next show we saw was a circus from new circus group Semi Circus. 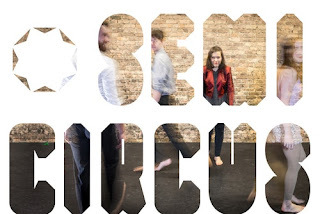 Semi-Circus started in 2016 as a circus collective. They use circus skills, physical theater, improv and other skills to create plays. Murmurations is their first show. By the way, a murmuration is a formation of starlings that make complex and interesting formations as they fly. This is a good word for this kind of work, as the actors murmurate (assuming it's a verb) as they display their skills and their foibles. 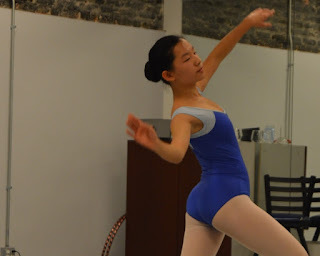 The last show we saw of the Chicago Fringe was Melody by Tiffany Lawson Dance. Billed as an original superhero ballet, the show follows young dancer Melody, who has super powerful feet, and uses her dancing to vanquish bad guys. Her friends include Hoops, Hugs, and Courage, and they help her to get through to defeat her evil twin Dissonance. There is a live band, including a trombone player that was a lot of fun to watch and listen to. Looking at their website, this looks like a show that they toured to Chicago libraries this summer. It seems like a great fit for a library's young audiences program. However, my son is 9, and we were hoping for an actually choreographed superhero ballet, complete with lots of athletic moves and powers. This was more like a way to get kids to see their first dance show. Don't get me wrong, the show was great for the 3-5-year-old set, who got to dance, and sing, and see live music and dance being played out. There were a lot of interactive little pieces, including a pre-show by one of the performers who is apparently also a kid's music singer, and he played some nice interactive songs (and plugged his CD!) During the show, director Tiffany was very proactive in making sure that kids would be included, would get up and dance, and helped encourage them. Apparently, they do a lot of stuff that is not kid oriented, and I'd be interested to see that sometime!